Options Solutions is proud to exist in communities that are dedicated to the ongoing education and support of adolescents, and is grateful to all of the clients and educational leaders who have helped us flourish in the Lower Mainland. From sponsoring field hockey tournaments and graduation events, to being recognized as the West Vancouver Small Business of the Year in 2013, Options Solutions is committed to being involved in and giving back to the communities that have contributed to its success. 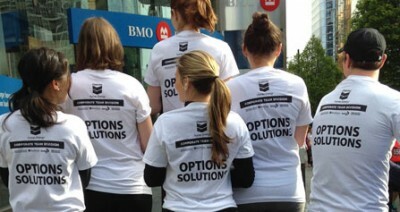 Options Solutions also helps a select group of students pro bono each year, changing educational access for future generations. Many PACS use these forums as fundraising events and Options has contributed to raising over $50,000 for local schools. The goal of our presentations and workshops is to provide parents and students with the information they need to navigate the post-secondary process with grace and good humour. We offer two types of sessions created specifically for high school students and their parents: an interactive parent and student admissions simulation workshop and a parent and student informational presentation that focuses on such topics as course planning and the Canadian admissions process. We welcome the opportunity to work together with any school official, PAC member, or parent to create a dynamic event for your community. Read more about the speaking engagements we offer here.